As someone who spends most of their life with their head in the clouds, it's fantasy goodies that most catch my attention. If clothing looks like armour, I want it. If it's a weapon, I want it. To be honest, if a workout can be completed all while keeping my mind firmly rooted in a fantasy world, I will do it. The trouble is that fantasy gifts are actually quite hard to come by and my nearest and dearest struggle to buy for me. If you do a search for 'fantasy gifts' most of what you'll get back are fairy figurines, pewter dragons with glass orbs, 'stone' gargoyles and Alchemy Gothic products. And these are great, but they don't suit my personal taste. I mean, I love dragons, but most figurines are all the same, and once you have five or six, there's really no need for any more. 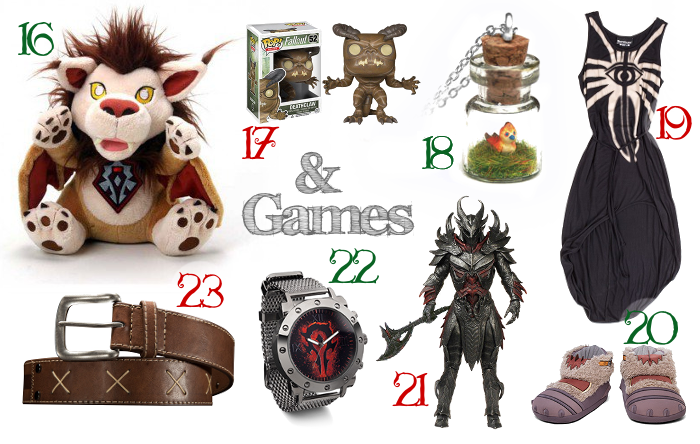 And so, it is because of this difficulty to find great fantasy gifts that I focused on that as a theme for one of this year's gift guides. Because it's not just me who is a challenge to shop for - I struggle with my best friend every year, and my boyfriend can be a little tricky, too. So I know others are in the same boat. 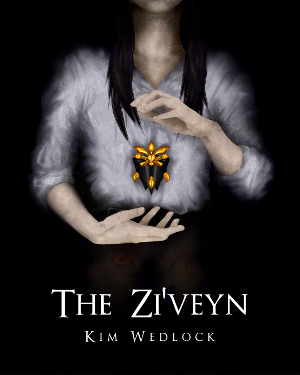 Fantasy comes in different forms, however, so rather than one cohesive gift guide, I've made three: generic fantasy, book- and movie-based fantasy, and game-based fantasy. 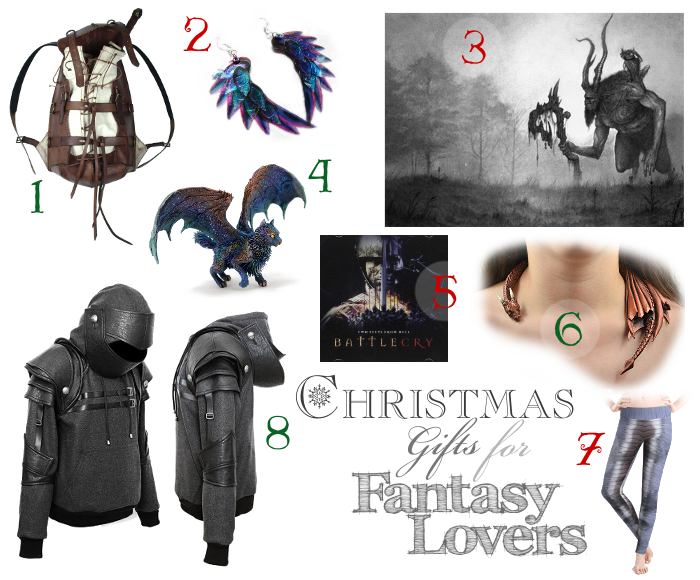 So if you're looking for unique and original fantasy gifts this Christmas, make yourself comfortable! For your generic fantasy lover - the one who spends their time doodling dragons and eats up everything fantasy that crosses their path, dribbling over concept art from games they've never played and probably never will - I've got quite a collection. For the more adult fantasy lover, this (3) fantasy metal wall hanging by artist Olivier Villoingt makes a wonderful and eye catching addition to the living room without being overpowering, while this (4) handmade winged cat statuette by the incredible Evgeny Hontor steals more attention, but still sits snugly out of the way, catching attention only when desired. For the more daring, who like to express their passion more openly, these (2) handmade dragon scale wing earrings are certain to turn heads, while this (6) sleeping pet dragon draper necklace will leave them staring in confusion. But only because they just don't understand. And then there are the lunatics, the obsessive fantasy lovers like myself who have no shame in expressing their obsession. This (1) leather adventurer's backpack is big enough for all your dragon-slaying needs, whether you're out roaming the wilderness or expecting an unnatural confrontation while doing your groceries. But of course you need armour if you're to survive unscathed, so these (7) steel plate armour leggings are a good choice, as well as the (8) knight hoodie - it might not actually protect you from crossbow bolts, but it will keep you warm. And to complete the insanity, some (5) epic music by Two Steps From Hell so you can pretend your winter morning run is actually the approach of the knight who will single-handedly save the world. Then there are the quiet fantasy fans, those who sit silently but for the occasional gasp or giggle while their noses are stuck between the pages of another world. They may not express their love for fantasy as openly, but it burns just as brightly. So why not introduce them to a new fantasy world with (9) The Archguardians of Laceria by - oh - me, or indulge them in one of their favourite worlds. 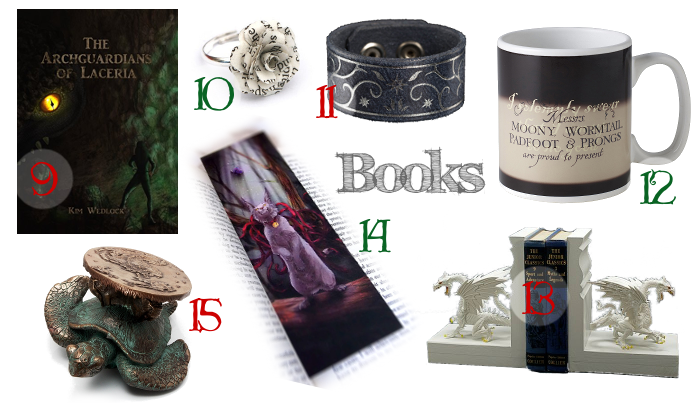 This (15) figurine of the Great A'Tuin is perfect for Discworld fans and this (11) Gondor wrist cuff is a great understated accessory for Lord of the Rings fans, while this (12) heat changing Harry Potter mug is perfect for their bookside cuppa, and this (10) handmade book flower ring can breathe new life into old, broken copies of their favourite titles. (13) Handmade dragon book ends are also a must-have, and bookmarks are always appreciated, especially when covered in unique art work like LeucisticLynx's (14) 'Look Up Sometimes' fantasy lynx bookmark. And then there are the gamers, the fantasy lovers who indulge instead in replicas and figurines from their favourite visual worlds. Because while books encourage the imagination to envision, actually seeing other people's ideas can be inspiring on its own. Plushies are always a good idea, and this (16) wind rider cub plush from World of Warcraft is a great place to start. As a bonus, there's even a unique in-game companion pet who, if you don't mind me saying so, is my favourite in the whole game. Or perhaps a miniature Pepe companion, like this (18) handmade Pepe necklace, because who doesn't love Pepe?! And for the more practical, or people who love to express their passion for fantasy games, this (19) Cassandra Believer dress from Bioware's Dragon Age Inquisition is a wonderful thing to have in the wardrobe, and it's certainly easy to wear, and this (23) Witcher White Wolf belt from Jinx is also a wardrobe staple, alongside this (22) Horde watch to make sure you're not late to the next raid, during which these (20) Durotan Plush Slippers will keep your feet toasty and safe from nibble frostwolves. How did I do? And also, can I have it all, please?